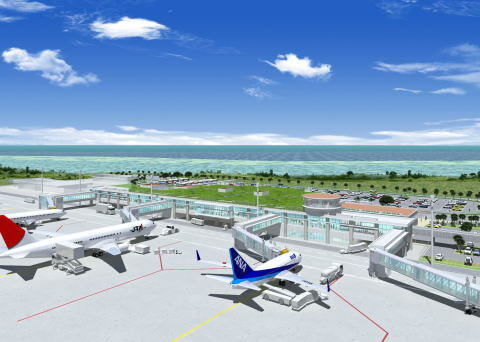 The new Ishigaki Airport that has been in the works for 37 years is finally opening for business today. It’s been a work in progress for nearly four decades, but Ishigaki Airport finally has a state-of-the-art airfield capable of handling larger aircraft. The new Ishigaki Airport officially opens today, although an official dedication of the facility took place a few days earlier. Governor Hirokazu Nakaima reflected on the old airport and the problems it endured during the 37 years it took to modernize. “This new airport will contribute to prefectural promotion development as a southern international exchange base” he said. About 1,000 local administration and economic development officials participated in the ceremonies at the air terminal building in Shiraho, Ishigaki City. The new airport’s runway is 500 meters longer than the old airport, making Ishigaki Airport capable of handling longer range –and larger—aircraft capable of both international flights and direct flights from the Japanese mainland. The runway is 2,000 meters long. Airport officials predict the longer runway will facilitate to an increase in tourists, as well as shipments of agriculture, forestry and fishery products. The new Ishigaki Airport planning began in 1976, and has seen dozens of construction position modifications through the years as opponents lobbied for changes, fearful that coral reefs would be destroyed in the process of building the new facility. Local residents were also opposed to giving up farmland. With the new airport in operation, tourists from Taiwan, Hong Kong, Shanghai and South Korea are expected to fly directly to Ishigaki. Ishigaki is only 30 minutes away from Shouzan Airport inTaipei, and airlines are taking a close look at how they can increase business with the Yaeyama Islands.